Conference North side Gainsborough Trinity are in talks to sign reality television star Jake Quickenden. 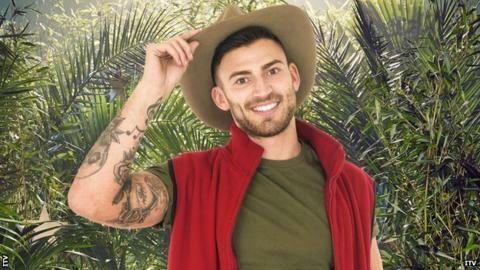 Quickenden, who was runner-up to former world superbike champion Carl Fogarty on I'm A Celebrity, Get Me Out Of Here was also an X Factor contestant. The 26-year-old was a youth-team player with hometown club Scunthorpe United. Trinity boss Steve Housham told BBC Radio Lincolnshire: "He's a talented footballer. It's not like he's someone who's not kicked a ball before." Quickenden also played at non-league level with Frickley Athletic and Bottesford Town but gained fame by appearing on the X Factor in 2012 and 2014. Most recently he appeared in I'm A Celebrity - another ITV show which also featured former Wigan, Fulham and West Ham midfielder Jimmy Bullard. Gainsborough are 15th in the Conference North Table - five steps below the Premier League. Housham added: "The chairman is an ambitious guy and wants to get him down for a game. "There are still a lot of dealings to go through, but it could be a case of getting him down before the end of the season." Last season Doncaster Rovers signed One Direction singer Louis Tomlinson as a non-contract player. Read more on Carl Fogarty wins I'm A Celebrity... Get Me Out Of Here!